The BBC reports that a Saudi women has been (miraculously) jailed for three years for severely beating her maid. 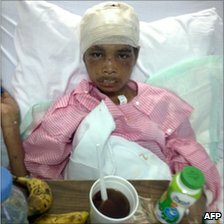 The maid from Indonesia was burned with an iron to the face, stabbed with scissors and suffered from numerous broken burns. The Indonesian Embassy is pushing for a harsher sentence given than the maximum sentence possible was 15 years. Human Rights Watch reports that this was the first time a jail sentence has been passed down to a Saudi national for such an attack.